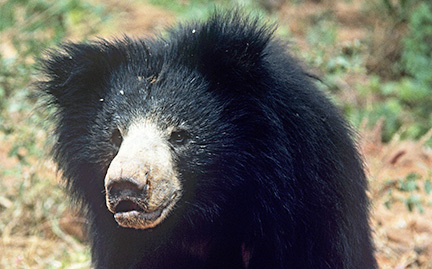 Sloth bears live in a variety of habitats on the Indian subcontinent. They have long, shaggy hair and primarily feed on termites and ants. Females usually give birth to one or two young, and carry their cubs on their backs for several months to protect them from predators. Cubs stay with their mothers for up to two and a half years. The biggest threats to sloth bears are habitat loss and poaching.